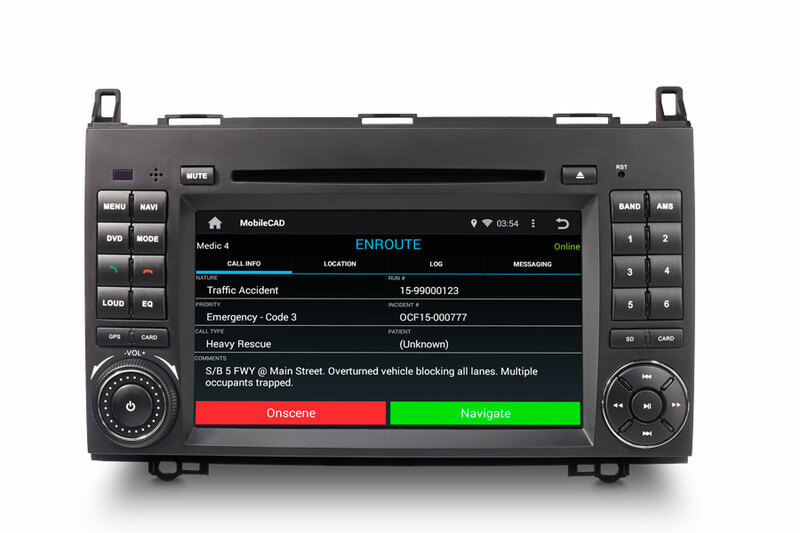 The ALC-1000 is a high resolution, touchscreen vehicle computer that offers a robust, network connected platform for hosting fleet applications, while maintaining a clean and professional factory appearance. No visible wires or brackets to become loose or broken. Unlike tablets, smartphones, and personal navigation devices, the all-in-one ALC-1000 will last as long as your vehicle. Retain the factory vehicle look while consolidating your navigation, rearview camera, stereo, and other devices into one cohesive unit. The ALC-1000's in-dash design integrates into your vehicle for seamless operation by connecting to the factory wiring harness, allowing for a simple install without cutting or splicing wires. Reduce or eliminate backing accidents thanks to the integrated rearview camera. Keep your drivers focused on the road with Bluetooth hands-free calling. The ALC-1000's all-in-one platform combines a hi-resolution display, dual core processor, flash storage, GPS navigation, rearview camera display, Bluetooth, AM/FM stereo, and more into one robust multifunction display (MFD). Save on equipment purchases and installation cost, while eliminating cab clutter by combining multiple pieces of hardware into one unit. The ALC-1000 is matched to your vehicle's make, model, and year to ensure a clean factory look and ease of installation. Reduce radio traffic and free up dispatch resources using the ALC-1000 with Atlas Labs MobileCAD. MobileCAD turns your device into a sleek, in-dash mobile data computer/MDC capable of status updates and timestamping, display of detailed incident information, automated navigation, and more. MobileCAD integrates with existing dispatch and logistics systems using the Atlas Labs Web API. Save labor and fuel costs with efficient routing using the integrated navigation features of the ALC-1000. Select between a variety of applications including Waze for voice-guided directions, rerouting, and ETA to your destination. Audio is routed through your vehicle speakers ensuring the highest level of clarity, even at low volumes. Reduce response times by automatically pushing destinations from your dispatch system using MobileCAD and the Atlas Labs Web API. Deploy and update Atlas Labs and other Android-based GIS and Mapping apps using the Device Management Web Portal. Improve safety with a wide-angle rearview display while backing. When the vehicle is placed in reverse, the ALC-1000's rearview camera is automatically activated. The ALC-1000 is compatible with a wide array of cameras and includes software based mirroring. In addition to rearview cameras, the ALC-1000 may be switched into auxiliary video mode for viewing sources such as satellite receivers, side-view cameras, and more. Pair iPhone, Android, Windows, or other Bluetooth enabled phones for hands-free speakerphone. Stream music and playlists over the premium 4 x 45W sound system of the ALC-1000 - without cables, keeping your vehicle looking clean and professional. Bluetooth support includes Hands-Free Profile, Audio Profile (A2DP), AVRCP1.5, and Serial Port Profile (SPP). Listen to your favorite radio station, keep up with current events, and enjoy crystal-clear sound via the built-in AM/FM stereo with 4x45W amp. RDS technology displays current radio station and song information on screen. Use the ALC-1000's RCA outputs to connect with high power amplifiers and cross-overs. Enable staff to view video content such as training courses while in the field using the ALC-1000. Supported media include USB flash drives, micro SD cards, DVD/CDs, or downloaded files via the device management platform. Remotely configure and manage your fleet of ALC-1000s from your browser with the optional device management platform. Automatically deploy and update applications to your in-dash ALC-1000s over the internet. Deploy wireless and VPN profiles, content, and other settings to your devices. Keep tabs on your ALC-1000 with realtime views of disk usage, software inventory, network settings, and other health parameters. Keep your data safe with the ability to remotely lock and wipe your ALC-1000s from the web management console. Atlas Labs (formerly Logic Data Systems) is a leading provider of network connectivity and vehicle technologies for emergency responders, delivery services, tow trucks, private transportation, and more. Our passion is to create revolutionary systems that enable organizations to operate cohesively with critical information available at all times. Every device we engineer is made to withstand harsh conditions, simplify processes, reduce operating costs, enhance safety, and ensure top-notch useability. We leave no stone unturned when exploring creative solutions for specific business needs. *This field is required. *This is not a valid name. *This field is required. *This is not a valid email address. *This field is required. *This is not a valid company name. *This field is required. *This is not a valid phone number.